Playtime from Morty’s point of view. Kristyn Vitale has always owned cats. As a child, she used to watch them and wonder what was going on in my cats’ heads. Kristyn feels that her curiosity about how cats see the world led her to a career path where she could explore how cats think directly by measuring their behavior. Although Kristyn’s dream was to work with cats, there were so few opportunities for this line of work that she decided to instead study Zoology, which she felt would allow her to work with animals in some capacity. During her undergraduate studies, she met the late Dr. Penny Bernstein, a professor who studied cat behavior. 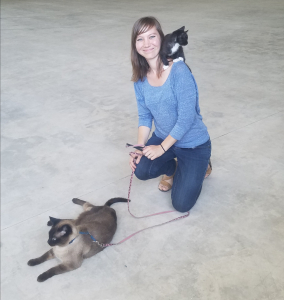 “When I saw that someone had made a career out of studying cat behavior I decided this was the route I wanted to take,” Kristyn said. Philosopher’s Path (哲学の道): Walking path in Kyoto. 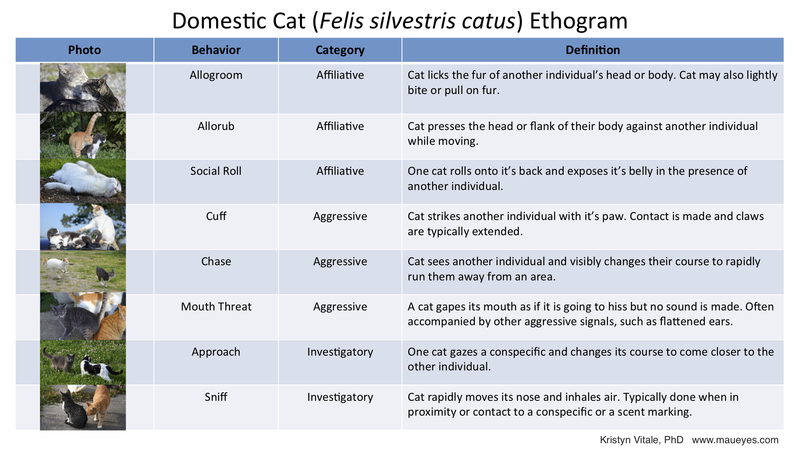 Definitions of some of the social behaviors displayed between domestic cats. Affiliative behaviors are those used during interactions with preferred associates- including other cats and humans! They often indicate a social bond between the individuals exists. Aggressive behaviors are displayed during conflicts. Sometimes aggressive behaviors are modified for use during play- like cuffing and chasing. Always watch the full interaction to better understand the behavior’s function.